At the invitation of President of the French Republic Emmanuel Macron, Secretary-General of the United Nations António Guterres, President of the World Bank Group Jim Yong Kim, Vice Premier of the State Council Ma Kai will travel to Paris, France as Special Envoy of President Xi Jinping to attend the One Planet Summit on finance in support of climate action on December 12. In Paris, Vice Premier Ma Kai will speak at the high-level session in the afternoon of December 12 in which he will reiterate China's support for the Paris Agreement and positive stance on participating in the global cooperation on combating climate change, elaborate China's position on climate funding, and showcase China's successful practices in developing green finances and pursuing a transformation to the low-carbon economy. On December 15, the 3rd Foreign Ministers' Meeting on Lancang-Mekong Cooperation (LMC) will be held in Dali, Yunan Province. At the invitation of Foreign Minister Wang Yi, Senior Minister and Minister of Foreign Affairs and International Cooperation Prak Sokhon of Cambodia, Foreign Minister Saleumxay Kommasith of Laos, Minister of State for Foreign Affairs U Kyaw Tin of Myanmar, Foreign Minister Don Pramudwinai of Thailand, Deputy Prime Minister and Foreign Minister Pham Binh Minh of Vietnam will attend the meeting co-chaired by Foreign Minister Wang Yi and Cambodian Senior Minister and Minister of Foreign Affairs and International Cooperation Prak Sokhon. The LMC, as the first sub-regional cooperation mechanism set up by countries along the Lancang-Mekong River following the principles of mutual consultation, common contribution and shared benefits, aims to deepen good neighborliness, amity and pragmatic cooperation among the six countries, serve the economic and social development of sub-regional countries, forge a community of shared future featuring peace and prosperity for the Lancang-Mekong River countries, support ASEAN Community building as well as regional integration, and promote South - South cooperation and the implementation of the UN 2030 Agenda for Sustainable Development. Since its official launch on March, 2016, the LMC has been advancing by leaps and bounds, resulting in a great number of outcomes. The ever-deepening political mutual trust, trade and investment cooperation and people-to-people exchanges have brought tangible benefits to all parties and strengthened traditional friendship and mutual understanding among the peoples of the six countries. These achievements, as the best reflection of the firm commitment and strong will of all parties to advance sub-regional cooperation, promise a broad prospect for the development of the LMC. We hope that with the concerted efforts of all parties, this LMC Foreign Ministers' Meeting will score great success and reap fruitful outcomes. Q: US President Trump announced on December 6 the recognition of Jerusalem as the capital of Israel and the decision to move the US Embassy in Israel to Jerusalem. I know that you expressed China's concern yesterday. I am wondering if you have anything to add today? A: The status of Jerusalem is one of those issues at the core of the Palestinian-Israeli dispute. As a complicated and sensitive issue, it touches the emotional string of different ethnicities and religions. To seek its final solution through dialogue has always been the universal consensus of the international community. China firmly supports the Middle East peace process. We support efforts to handle the Middle East-related issues including the status of Jerusalem in accordance with the relevant UN resolutions and stand behind Palestine in building an independent, full sovereignty state along the 1967 borders with East Jerusalem as its capital. 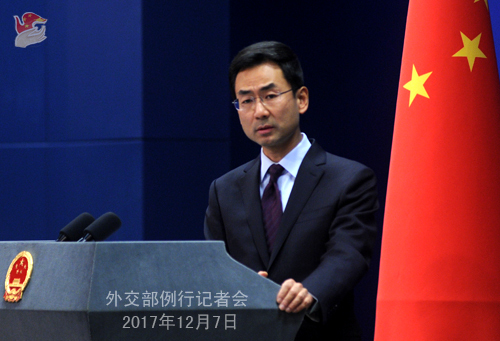 China calls on all parties to uphold an objective and just position and contribute to the early resumption of negotiations between Palestine and Israel for the benefit of regional peace and stability. Q: Russian President Putin announced that he will run for the 2018 presidential election. What is your comment? How does China comment on President Putin's role in developing China-Russia relations? A: Presidential election is the internal affair of Russia. We respect President Putin's decision to run for the election. China firmly supports Russia's efforts for national stability, development and rejuvenation and believes that Russia's presidential election will be carried out smoothly. As for our comment on President Putin's contributions to China-Russia relations, I believe everyone knows clearly that the China-Russia Comprehensive Strategic Partnership of Coordination is at its unprecedented best level, which is inextricably linked with the leadership of the two heads of state. China stands ready to work with Russia to move forward the China-Russia Comprehensive Strategic Partnership of Coordination by implementing the consensus reached between the two heads of state. Q: Regarding the 3rd LMC Foreign Ministers' Meeting that Foreign Minister Wang Yi will attend and co-chair, could you talk about China's expectation for it? The first is to comb through the road covered and consolidate the cooperation outcomes, with particular highlight on the LMC's feature of being pragmatic, highly efficient, project-oriented and beneficial to people's livelihood. The second is to summarize experience in cooperation so as to cement a solid foundation for the six countries to work as one in deepening cooperation and focusing on development. The third is to exchange views on the future course of the LMC, endeavor to sustain the cooperation momentum, expand cooperation areas, and forge cooperation highlights, thus laying groundwork for the next year's second leaders' meeting. As a friendly neighbor and sincere partner to the other five Mekong River countries, and guided by the spirit of the 19th CPC Congress and the neighborhood diplomacy of amity, sincerity, mutual benefit and inclusiveness as well as the policy of forging friendship and partnership with neighboring countries as established by General Secretary Xi Jinping, China will work with the Mekong River countries to advance the building of a community of shared future for the Lancang-Mekong River countries which we believe will stand as a pioneering example for the building of a community of shared future for all mankind. Q: The Chinese military official expressed strong dissatisfaction with India today after the recent crash of an Indian drone on the China-India border. I wonder if the Chinese Foreign Ministry has any comments on this incident? A: The Chinese military has released relevant information. An Indian unmanned aerial vehicle (UAV) recently invaded China's airspace in the Sikkim section of the China-India border and crashed. China's border forces acted professionally and responsibly, and conducted verifications of the device. I need to point out that the Sikkim section of the China-India border has already been demarcated, and the Chinese side of the borderline is China's territory. What the Indian side has done violates China's sovereignty and works against peace and stability in the border area. China is dissatisfied with that and has lodged representations with the Indian side. 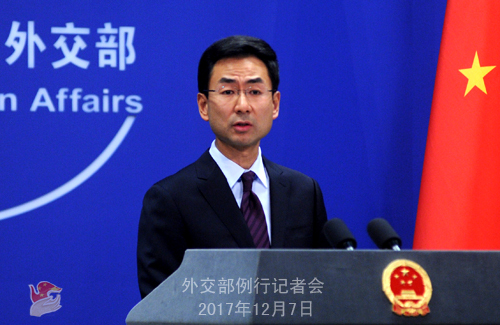 China asks India to immediately stop flying its unmanned aerial vehicle near or to the border and work together to ensure peace and tranquility of the border area. Q: When speaking in Wellington, Deputy Prime Minister and Foreign Minister of New Zealand Winston Peters gave a complimentary account of the 45 years of New Zealand-China diplomatic ties and vowed to further promote bilateral relations. What is your comment? A: China appreciates these positive remarks made by Deputy Prime Minister and Foreign Minister Peters on China-New Zealand relations. Over the past 45 years since the establishment of diplomatic ties, China-New Zealand relations have been enjoying a sound momentum of growth with high-level political trust, and fruitful outcomes from pragmatic cooperation. Together, we have pulled off a remarkable record of "firsts", delivering tangible benefits to the two countries and the two peoples. The growth of China-New Zealand ties once again proves that as long as we stick to the principle of mutual respect, equality and mutual benefit, carry out pragmatic cooperation with a positive attitude, two countries will be able to develop their relations in a sound and steady way and deliver benefits to both countries and peoples. December 22 marks the 45th anniversary of the establishment of the diplomatic ties between China and New Zealand. A series of celebration events are already underway. China stands ready to work with New Zealand to strengthen dialogue, exchanges and cooperation in various fields and see that the high-level China-New Zealand Comprehensive Strategic Partnership achieves greater development. Q: Do you have any information on the model of the drone? Did China lodge the representations in Beijing or in New Delhi? A: I have no information on the specifics of the drone. I would refer you to the military if you want to know more. Regarding the details of the representations we made, I have no details on hand at the moment. But like I just said, we have made stern representations with the Indian side. Q: Will the suing of the Venezuelan state oil company by Sinopec's US subsidiary impact China's relationship with Venezuela? A: I just learned this report. It is an ordinary commercial dispute. There is no need to read too much into it. I want to stress that China attaches high importance to the development of China-Venezuela relations, and we stand ready to continue with our all-around pragmatic cooperation with Venezuela on the basis of equality, mutual benefit and common development. Q: Leaders of some Arab states and Palestine once said that the US has major influence on the peace process in the Middle East. But US President Trump's announcement yesterday of recognizing Jerusalem as the capital of Israel made Palestinians believe that the US now has no role to play in that peace process, a process which to many Palestinians may have become non-existent. What is China's take on the future course of the Middle East issues and what kind of role is China planning to play? A: China firmly supports and advances the Middle East peace process. We support the just cause of the Palestinian people to restore their legitimate national rights. We remain in close contact with Arab states and other major parties on the Middle East issues including the Palestinian issue, and we have been backing up and speaking out for Arab states on important international occasions including at the UN. Our just position has won us wide acclaim from Arab states. Such a just position will continue to be upheld and we will work with other parties to actively move forward the Middle East peace process so that peace and stability could be ensured in the region at an early date. Q: There have been reports that the Chinese officials have been unhappy with Canadian media coverage of Prime Minister Justin Trudeau's visit in China. What is China unhappy about? A: Prime Minister Trudeau just wrapped up his visit in China which also took him to Guangzhou for the 2017 Fortune Global Forum. My understanding is that the visit was successful on the whole. President Xi Jinping met with Prime Minister Trudeau, and Premier Li Keqiang co-chaired with him the 2nd Annual Dialogue between Chinese Premier and Canadian Prime Minister. As for Canadian media's coverage of this visit, I need to check on them. 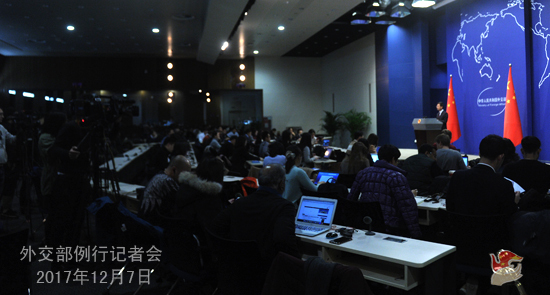 But we hope all media could be objective and unbiased in their coverage of China and China's external relations, including the Canadian media. Q: Do you have any more detailed information on where in the Sikkim Section this drone crashed? And was it anywhere near the Donglang region? A: I would refer you to the military authority for more details. Q: There were expectations that China and Canada might begin formal negotiations on the free trade agreement during Prime Minister Justin Trudeau's visit to China. The Prime Minister is scheduled to board an airplane back to Canada in about an hour. There does not appear to have been a start on free trade talks. What are the key issues that prevent it from happening here? A: As far as I know, during Prime Minister Trudeau' visit, both sides had friendly and in-depth discussions on the FTA where positive attitudes were shown and certain progress was made amid consultations. China always maintains that a free trade deal will benefit both sides. We would keep working with the Canadian side with a pragmatic and open attitude to promote the China-Canada free trade zone and create conditions to begin the trade talks as early as possible. Q: Russia's deputy foreign minister yesterday said in New Delhi that Russia is trying to persuade China about India's membership in the Nuclear Suppliers Group (NSG). He also criticized the US, saying that it is not doing enough to persuade China to actually commit itself for India's membership in the NSG. What is your reaction to this? A: Our position on this issue remains unchanged. China supports the NSG in addressing this issue through an open and transparent inter-governmental process under the principle of consensus-building. At present, all NSG members endorse the two-step approach, i.e., to first work out a non-discriminatory formula applicable to all non-NPT states, and then to move on to country-specific applications of non-NPT states. As I understand, the current main sticking point is how to address the issue of the relevant non-NPT states which wish to join the NSG as non-nuclear-weapon states (NNWS) while not concluding the required Comprehensive Safeguards Agreement(CSA) with the IAEA. Under Article III of the NPT, it sets out very clearly that NNWS must conclude the CSA with the IAEA and the UN security Council Resolution 1172 also set out very clearly that the relevant non-NPT states cannot have the status of a nuclear-weapon state. Therefore, if we humor the wish of some, two serious corollaries would ensue. The first is that our consent would amount to an acknowledgment of the NWS status of the relevant non-NPT states. The second is that it may encourage other countries to follow suit without concluding the CSA with the IAEA. Under such circumstance, the IAEA's safeguards regime will be rendered ineffective, uprooting the NPT and the international non-proliferation regime as a whole. 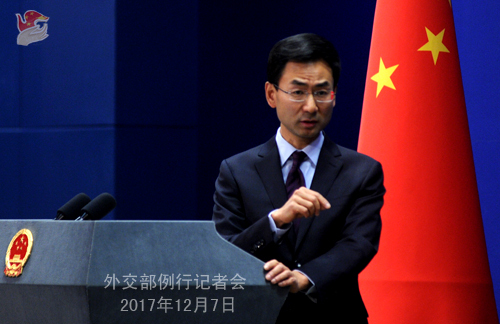 That is why China hopes that the NSG could put heads together and have more in-depth discussions to work out this issue so as to arrive at a non-discriminatory formula that is acceptable to all within the NSG and earnestly safeguards the international non-proliferation regime with the NPT as the cornerstone, and then, to take up country-specific applications by the relevant non-NPT states. Follow-up: Is this going to figure in the forthcoming foreign ministers meeting of China, Russia and India? A: That meeting as you mentioned is mainly for discussions on promoting trilateral practical cooperation. The three foreign ministers will also exchange views on international and regional issues of common interest. Q: Just one more follow-up on the free trade agreement issue. The Canadian Prime Minister has said that he wants a progressive free trade agreement with China, one that includes chapters on labor rights, gender rights and the environment. Does China believe that such issues belong in a free trade agreement? A: With regard to the specific areas of the free trade agreement, I would refer you to the competent department. Q: The US has asked China to crack down on postal shipments of synthetic opioid which President Trump says are fueling an American drug abuse crisis that he discussed with President Xi during his visit to China last month. What is China's position on this issue? A: After President Trump visited China last month, both China and the US have given briefings on the outcomes of his visit. During the briefings it was mentioned that the two sides agreed to continue to step up cooperation on the management and control of new psychoactive substances and its precursors as well as on anti-drug law enforcement and conduct bilateral anti-drug intelligence communication. China will continue with its effort to add the new psychoactive substances of mutual key concern to the list of controlled drugs. The two sides will enhance intelligence sharing on fentanyl-related substances, carry out case-by-case cooperation on drug-related postal parcels and join hands to crack down on illegal trafficking. According to my information, China and the US have maintained communication on the relevant issue afterwards. Not long ago, Chinese and US officials had discussion and exchange on bilateral anti-drug cooperation on the sidelines of the relevant international meeting in Mexico. Q: KCNA said today that it now considers the outbreak of war an established fact as a response to the latest military drills by relevant parties. What is your comment? A: We have been stressing time and again that the current situation on the Korean Peninsula remains complex and sensitive. We hope that all the relevant parties can exercise restraint and take actions that will ease the tension rather than provoking each other. Should there be war, it would be in no one's interests and the ordinary people would be the ones to take its toll. Q: Just a follow-up on the drone. You also use the word "recently". How recent was it? Was it sometime a few days back? A: I would refer you to the military for these details. Q: Now that Foreign Minister Wang Yi is going to New Delhi. He is going to hold talks with Indian leaders. Will this drone incident have a negative impact on bilateral ties? A: Foreign Minister Wang Yi is traveling to New Delhi for the China-Russia-India Foreign Ministers' Meeting. When in India, he will meet with senior officials of the Indian government. The two sides will exchange views on China-India relations and other issues of mutual concern.